Something easy and breezy for the hot days ahead is what I decided to make this weekend. My usual process is to rummage through my pattern boxes and pull 5 or 6 different looks and then look through my fabrics, decide on a match and then jump right in. 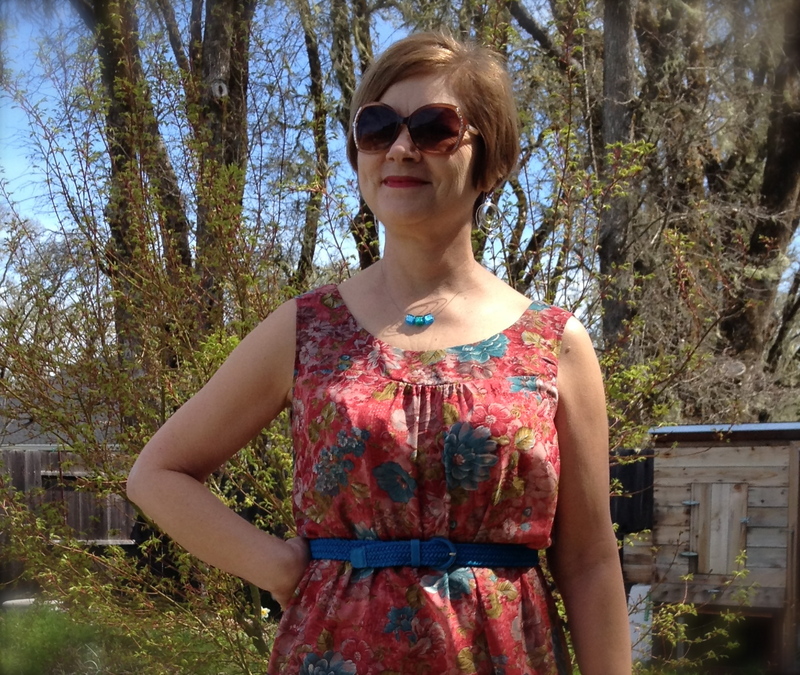 This time I chose Simplicity SewSimple #2004. Although it’s a very easy pattern, I added extra details to make it last longer and fit better. 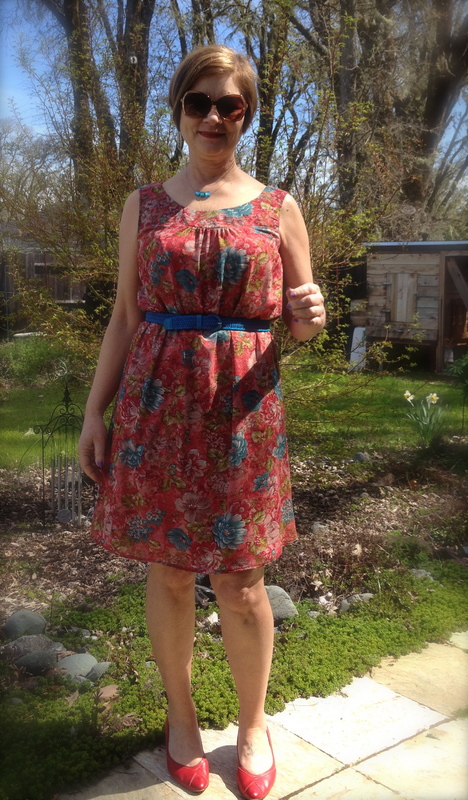 The fabric is a sheer floral that I purchased at the local senior center thrift. It’s a very delicate rayon, I think. Having sewn with vintage fabric from the thrift before, and then having my seams rip open with the the slightest movement of my body, I have learned that sheers should not be used for very close-fitting, structured garments. Thus, this simple shift with a bodice and gathering on the front and back, is a better choice. To give the bodice pieces more body and stability, I cut two fronts and two backs (instead of just one of each), and interfaced the inside of the bodice front and back. I used the other two as facings. This gave my neck edge a finished look; as I was able to sew the lining to the to the neck and then turn it to the inside. The front and back of the dress are both cut on the fold and gathered at the center top edge. I sewed the back to the back bodice, and the front to the front bodice. Then, I serged both seams for a clean and reinforced edge. 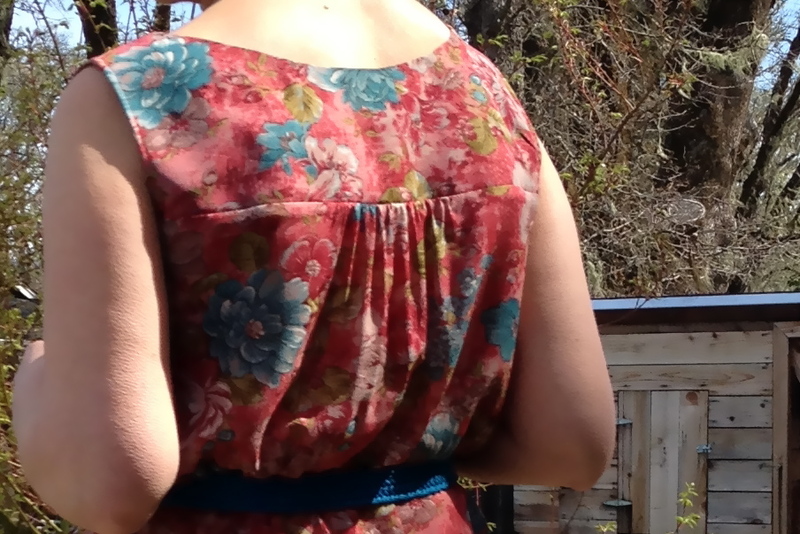 I did French seams on the side seams, serged the hem then turned it under twice, for a tiny top-stitched edge. Finally, I made one-inch bias tape from the left-over fabric to go around the armhole. That was the trickiest part. Sewing it right sides together, then folding it over so the raw edge meets the seam, and then folding it over one more time is a surgical operation. Trying to keep it folded over and sewing evenly around, is difficult with the sheer fabric. I did have to unpick a few wide places, but it turned out great in the end. Slow and steady is the rule when you do that type of sewing. I also find lovely vintage full slips and half slips at the thrift, which I know I’ll be able to use with one of my sewing projects. This time a pretty pink slip that I shortened a little by serging a folded piece right above the lace around the hem, made the perfect undergarment. 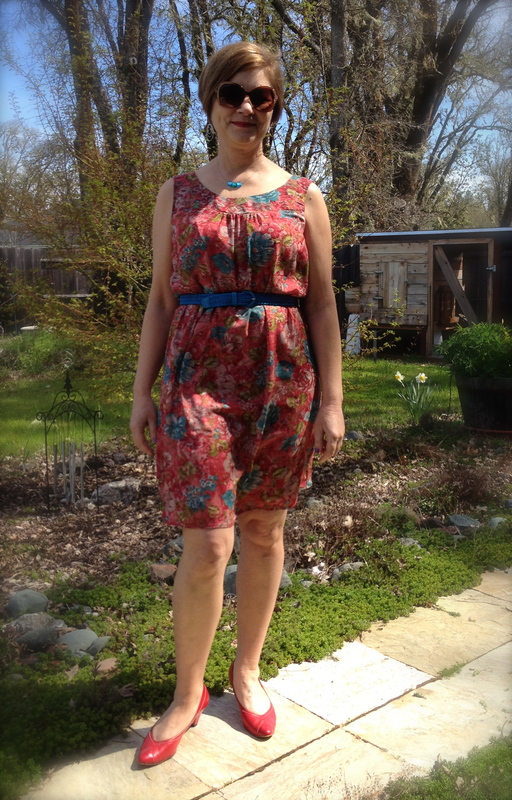 Besides the fabric and slip, the shoes and belt are also found treasures. I love upcycling! It’s so much fun! This entry was posted in DIY, Sewing, Upcycle and tagged diy, Dress, fashion, sewing, sheer fabric, simplicity 2004, upcycle, vintage fabric. Bookmark the permalink. I love upcycling too, You’ve done a smashing job Barbara. The perfect Summer dress. It looks great Barbara, and lucky to find the shoes to match, since it’s not a typical colour. I need a bunch of dresses like this to get through the humid summer: cool and loose, but with enough coverage up top. Also have to say I’m jealous of your spring garden. 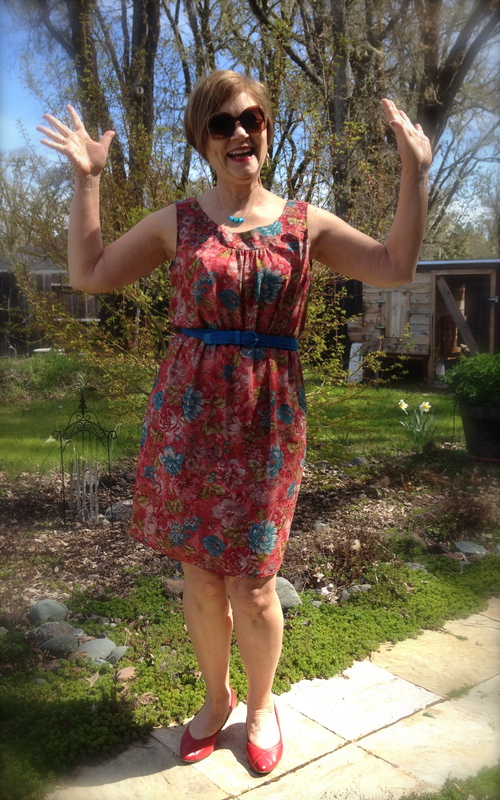 We still have melting piles of snow around here…..
What fabulous fabric to find in a thrift store! Beautiful colours. Thanks for all that advice on working with delicate sheers….going to bookmark this post for future reference. Perfect pattern for that floatiness too. Love it.